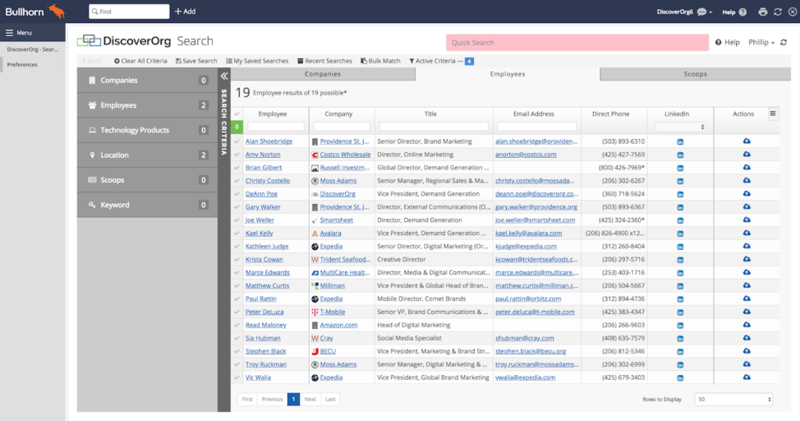 DiscoverOrg provides data on companies and contacts, including direct-dial & cell phone numbers, verified email addresses, job responsibilities, installed technology, and position within a company org chart. The platform also includes predictive intent data, and a host of business development tools. 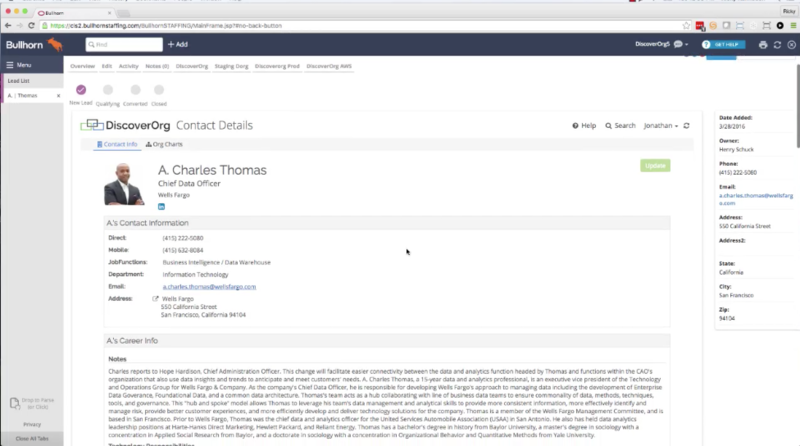 Access and upload all of DiscoverOrg’s org charts, as well as company and contact information, from directly within Bullhorn’s CRM. Supercharge full-desk recruiting efforts by building a network of clients and candidates in one place. DiscoverOrg publishes 10,000+ real-time scoops per week about staffing changes, personnel moves, and major projects indicating future talent needs. Recruiters are enabled by these scoops to partner on staffing initiatives ahead of the competition. The most in-demand candidates need you to pitch them their next career opportunity. DiscoverOrg helps you source passive talent with a precise range of technical skills and functional experience. 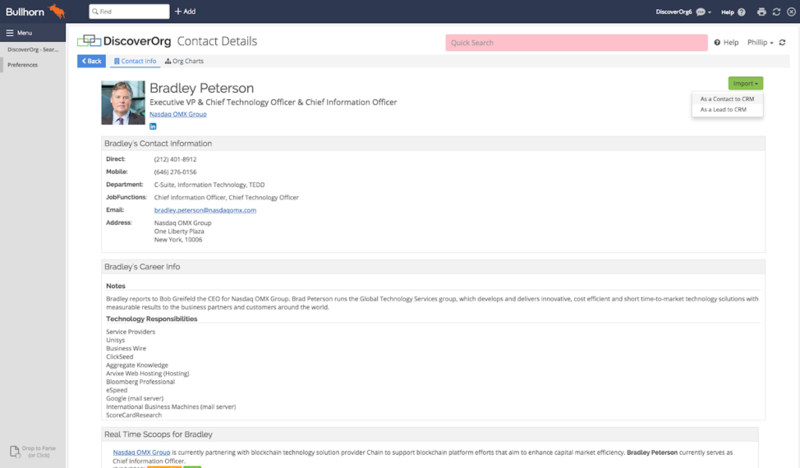 Recruiters can find and add employee profiles as new contacts or leads in Bullhorn with a single click. Complete your records with direct-dial phone numbers, cell phone numbers, and verified email addresses – so you can contact the right people directly. 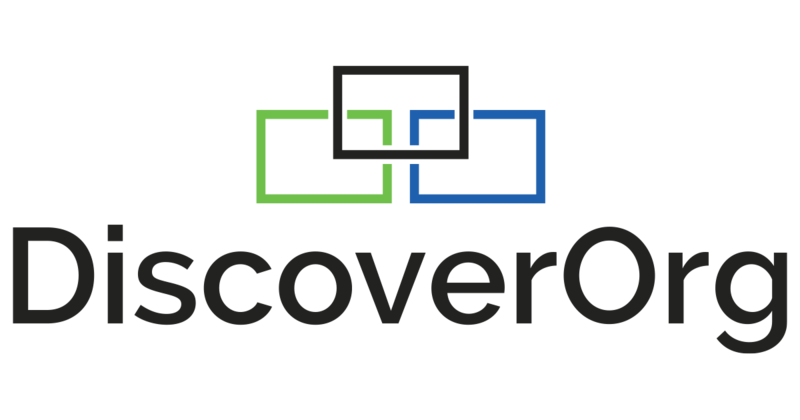 Each step of the recruiting lifecycle is enhanced with the DiscoverOrg integration. With comprehensive insight and streamlined workflows, recruiters can effectively manage their current candidate pipeline – and attract, engage, and nurture future candidates. Each step of the recruiting lifecycle is enhanced with the DiscoverOrg integration. With comprehensive insight and streamlined workflows, recruiters can effectively manage their current candidate pipeline - and attract, engage, and nurture future candidates.